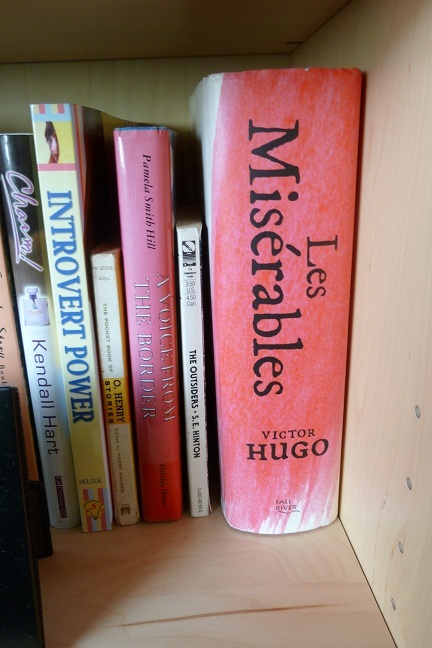 This week I’m doing a multipart review of the excellent but very long Les Miserables by Victor Hugo. Read about Volumes I and II here. Volume III focuses (though not immediately) on Marius, leaving Jean Valjean and Cosette out of the story for quite a while. This is where I think it helped the most that I knew the musical, or I would have been feeling very adrift! Marius was raised in wealth, but fell out with his grandfather over his estranged father’s politics. Turning his back on his grandfather and his money, Marius lives in Paris in relative poverty, scraping along on some minimal scholarly work–but contented with that. And then one day at the Luxembourg Gardens he sees a beautiful young woman out with her father and is hopelessly smitten. They carry on a lengthy courtship of glances, until one day she ceases to come and Marius is plunged into the depths of despair. Marius’ crowd of revolutionary friends do turn up in this book and I enjoyed getting more depth on them. At the same time, I was surprised by how shallow Marius’ connection to them was. He knows them, but he’s really not one of them. It gets more complicated with the barricade, but that’s Part IV. I was happy to see Enjolras, though, the leader of the group and one of my favorites from the musical. Marius’ path also intersects with the Thenardiers, who have come to Paris and fallen on even worse times. Take away the humor from the Thenardiers, and you have instead examples of just how low people can sink, both in poverty and in moral character. Two members of the Thenardier family particularly fascinate me. First, Eponine, the older daughter. I actually found her a more interesting character in the musical. There’s a spark of something in her, this sense that she could be so much more than her life has so far let her be. Oddly enough, I get less of that feeling from the book. I think it’s there, but she’s far more disreputable too. There also seems to be less of a relationship between her and Marius than the musical suggested, to the point that I can’t blame him for not returning her unrequited crush. It redeems him a bit, though I felt less for her. I was just a little disappointed regarding Eponine, but I was thrilled with Gavroche. I can see why the musical never got into the fact that he’s the Thenardiers’ son–he has only the most tenuous of relationships. He emerges in the book just as I had hoped, a plucky, cheeky street urchin, keeping his head up and his confidence intact no matter what life hands him. I love Gavroche’s spirit, and I also love that even in his own poverty, he’s still generous. He gives to others even if it means he won’t eat that night himself, and he seems to do it instinctively. Love, love Gavroche! I’m definitely not invested in Marius the way I was in Valjean, but that didn’t really interfere with my enjoyment of this section. The story was engaging even if I had mixed feelings about the main character. Ah Marius. I feel like I should find Marius annoying. Most of the things he does are just head-smacking moments. And yet, I can’t find it in myself to dislike him. He’s just such a sweet boy, and his heart’s in the right place. He’s sort of an all or nothing person. But he’s really smart and hardworking and he never complains about his circumstances and he gives money to people even when he doesn’t have any for himself. He just seems to lack a little common sense. I actually found Éponine a more sparky character in the book. And a little bit creepy, lol. That part where she scares off a bunch of armed robbers, the most notorious gang in Paris no less, just by laughing at them is a great moment. Well. I think in the musical, a lot of her character revolves around her love for Marius, and in the book you just get more depth to her. She talks about not eating every day and being cold and you see her hanging out with Thénardier’s awful friends. I think more of her character is centered on her poor circumstances and you see more of that side of her. I knew you’d probably be a bit disappointed in her character, but also figured you’d love Gavroche. He’s about ten times more cheeky and awesome in the book, partways because you get to spend a whole lot more time with him than in the musical. Speaking of his relation to the Thénardiers: in a scene cut from the movie, after Éponine’s death, Courfeyrac asks Gavroche if he’s OK and he says, “That was my sister.” I really wish they would come out with an extended director’s cut! Well, yes, Marius is just such a SWEET boy. I can’t hate him, but I can’t really love him either. There was a creepiness to Eponine in the book that was missing in the musical. But I also think the musical had such a clear idea that she wanted something more from her life, and I didn’t feel like I saw that so much in the book. Yes, a director’s cut for the movie should definitely come out! Mabeuf is another one of those sad, sweet characters. His trajectory downwards (his books! He sold his books!) is so very sad. Les Amis, I am sorry to say, ran together for me a bit. Hugo did that lovely section discussing each one, but he grouped SO MUCH information all together, that then I was struggling to remember details later on. However, I did like Enjolras and Grantaire quite a bit–they stood out more strongly for me. Yeah, they do tend to all run together. I think of all of them, Grantaire is the one who stands out the most, probably because he’s just not like the rest of them. The Amis honestly aren’t my favorite part of the story, but being in the fandom for a while, I’ve noticed they’re really popular, and it’s helped me to be able to differentiate them a bit. I still don’t know who’s who when I’m watching the musical, though. Heh. Interesting how the play and film both follow and diverge from the source material, the novel. I suppose the requirements of staging a musical (in film or theatrical form) require some tinkering with the characters. Good to know Gavroche comes out in the book much like he is in the film and play.